cdrecord,dvdrecord : These are the tools that actually burn the data or audio tracks on to your CDs and DVDs. 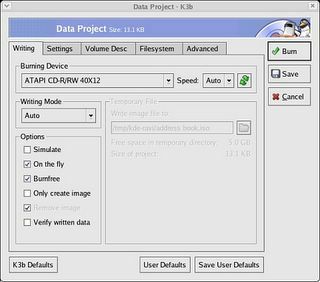 mkisofs : Prior to using cdrecord, you have to create an ISO image of the files you want to burn on to the CD. This tool helps you accomplish that. growisofs : This is a front-end to mkisofs which can be used to create amoung other things multi-session CD/DVDs. cdrdao : This is just like cdrecord but can be used to create mixed CDs. That is CDs containing both data and audio tracks. Here I will give an example each of creating an ISO image using mkisofs as well as burning the ISO image using cdrecord. This syntax of mkisofs is used for creating a ISO image from a file containing a list of all the files that should be included in the CD ISO image. The filenames are included one per line. These tools are 100% reliable and are enough to get the job of burning CDs and DVDs. But as you can see, there are a whole lot of options used and, sometimes there is the risk of mistakes happening due to passing wrong options to the commands. Earlier I used to burn CDs using these tools for lack of a reliable and easy to use front-end. But now there are a plethora of GUI front-ends that use these tools in the background and assist the user to burn CDs/DVDs with ease. Other than those stated above, you can also create mixed CDs containing both audio and data tracks as well as video CDs and DVDs by accessing the [File > New Project] menu. 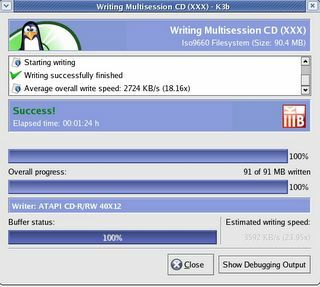 When you give the burn command, you are provided a nice dialog box where you can select to create single session or multi-session CDs.Whether to generate RockRidge, Joliet or UDF extentions for your filesystem and many advanced options like support for ISO level 1,2,or 3 and so on. And erasing and rewriting your RW CD is a clinch. Infact after using this excellent software, I am of the opinion that K3b can be put in the same league as its windows counterpart Nero Burning ROM. Writing CDs/DVDs in linux had never been this easy. 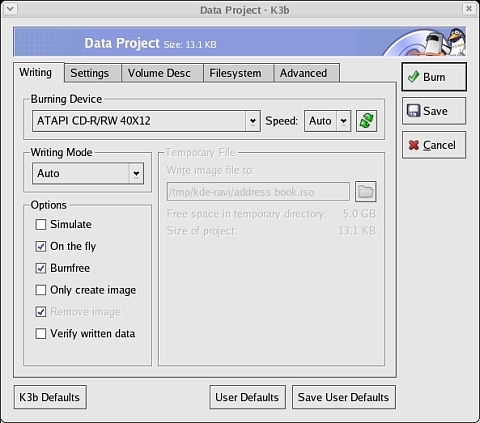 Here are a few screenshots of the K3b CD creator user interface.